As a business owner, we are all bombarded by information on how to best market our company among many other things for our business. For those who don’t primarily work in my industry, marketing, this can be very overwhelming thus pushing it to the ‘I’ll get to it later’ list of to-dos. It’s not that you, fellow business owner, don’t care about your business marketing strategy, it’s simply we you are overwhelmed and other ‘more pressing’ matters keep knocking any, current or new marketing ventures to the bottom of the list of tasks. Keep in mind that you don’t have to do it all and quite honestly, you shouldn’t. But, you really need to be where your competitors and consumers are, to help build your business, so stop pushing that stuff down. Further, you don’t need to be on all social medias and doing it all, just take it via bite sized pieces. Here are three easy things that you can do on social media sites that can help get your name out there and boost or brand your business. 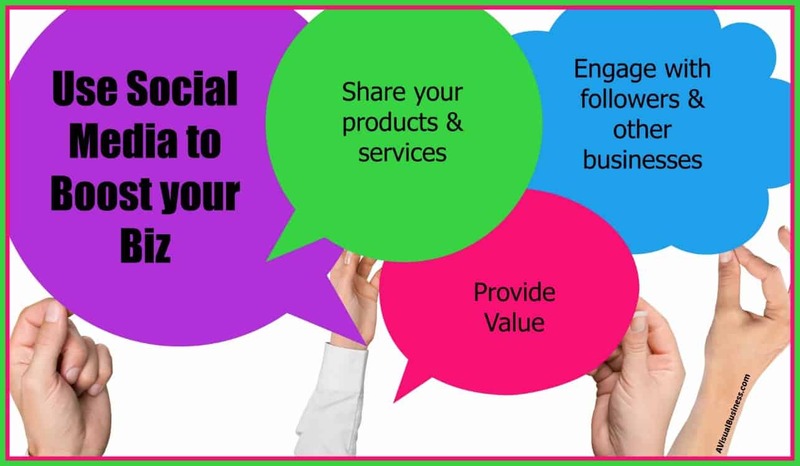 You likely sell some sort of product or provide a service, be sure you are sharing what you offer (products or services) as well as promotions, specials or behind the scenes on your business social media sites. By showing photos of what you are working on, who you are working with or projects completed by your business, people can see the quality of work you do and how they can benefit from it. Pictures, as we know speak MUCH louder than just using words, so be sure to help your work come to life or tell the story by using pictures that do the same. Further, this gives people an image, helps tell the story, in their mind to associate with your business name and brand. This is an easy way to keep your page active because you don’t have to try or think too hard about what content you can add to your page. Just inform people about what you are doing and how your product or service improves people’s lives. Don’t forget though, you want to keep it all about them and not shove your product/service down their throat all the time. Mix it up. Show of your work, tell your biz story but mix up your social media posts – cuz it’s not all about you! With your business Facebook page and other social media accounts, be sure to reply to people’s comments and questions. 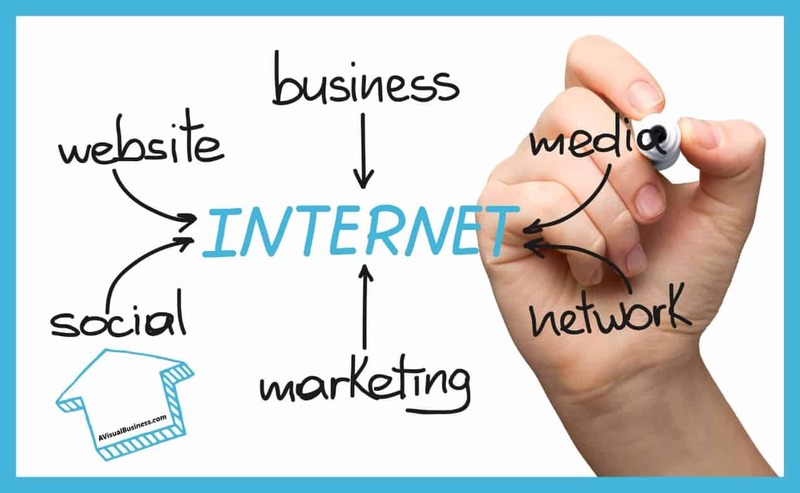 One of the reasons for you being on different online platforms is to engage with your audience. This is your opportunity to engage and interact with your followers. You get to learn what they like and what pains they have. This is a perfect place to assist them with those pains or thank them for their business. Nobody likes to be ignored, even online, so a simple reply can go a long way. It’s important to seek out other businesses, usually complimentary ones and engage with them. This helps to solidify other business referral partners and it increases the engagement on your social profiles. Not only that but you scratch their back, they will likely reciprocate – win-win! Since you are a business owner, you must have the inside scoop of what is going on in your industry or the knowledge of new tools and know how. 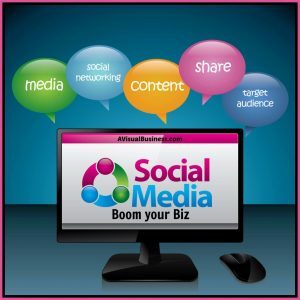 You can easily share helpful tidbits that can help other business owners or your target market. For example, if you provide lawn care service, you can share tips on how to prevent invasive plant species from growing in your yard. (Yea, good luck with that) Helpful advice and practical knowledge is helpful to your customers or clients as well as your target market thus potential customers or clients. It gives them information that they may not have known since they do not devote their time to your specific industry… it’s all about value. Hopefully these few tips have been helpful for you on how you can increase your business or boom your brand on social media. These shouldn’t take long or be very taxing on your schedule. Remember to push out the distractions, plan ahead and schedule and use your time wisely. Should you need any help with your social media or heck, you haven’t even created your social media pages and not sure where to start, before the above tips, I have created a 8 week Facebook video series that is DIY and you will love, oh and it’s affordable too. Check it out and contact me with any questions. Great tips, Kristen! I do share a lot of value from my biz handle, but I wonder if I give too much away? Do you have any tips for that? How do you know if you’re giving the right amount? Well Susan, that is a great question too.. so I ask you this.. as you are giving stuff away, are you getting something back in return, like their email address so you can add them to your list? Make that a priority! I totally agree. Social media shouldn’t take too much time. Planning is a big part of the process of sharing. Schedule time once a week to research and then schedule to share for the next week. Adding this task to your schedule will save you time and minimize the lapse in posts. Thanks for sharing your tips. Yes, I knew you would have great tips for this too Sabrina. thank you! Great tips as always, Kristen. I agree that sharing and building relationships is really the key to growing and expanding our reach and our business on social media. I know LInkedIn is a great platform, yet I haven’t quite figured out yet how to use it to build my business(es). I think engaging and staying in conversations on social media is really the most important value it offers us. It does take a lot of time and personally not having an assistant, I find it becomes tiring at times, which is why I only focus on FB and Twitter right now. There really is so much ‘noise’ in the online world, our task is to find what works for us and to keep doing more of the same. And keep educating and offering valuable information, as you never know when you will be the ‘expert’ someone will come back to because of something you’ve shared. LinkedIn is great for B2B and not everyone can use it as well. You are also right that engaging is key as well to build that relationship.. if you aren’t building, then you aren’t growing your biz. Maybe outsource someone who knows you enough to speak in your voice or have some canned things you can use to reply… or heck… like you are doing, focus on the ones that work for you and spend a little time each day engaging. You are doing great Bev. Great tips! I am actively working on scheduling and batching so it doesn’t take me so much time! Scheduling is definitely key Kimberly. Be sure you are reusing your evergreen content too. Excellent tips for using social media Kristen. Planning ahead and scheduling really are time savers and I’m working on improving this. It’s so important to work out which of the many platforms works best for your business and to concentrate on a few, rather than trying to do them all. So true Tami, no need to be on ALL platforms, it’s just not efficient. Scheduling and trying to stay out of that rabbit hole is key too. Great tips Kristen! I think the most insightful idea is that “It’s not all about you.” Mary Kay Ash (Founder of Mary Kay cosmetics) used to say that everyone had an invisible sign around their neck saying “Make me feel important.” Served her well! That’s right.. it just isn’t all about us. MkA clearly gets it Joan! Kristin, I love all these tips, especially #3! Providing value is the best way for your ideal clients to get to know, like, and trust you. Thanks for the reminder that we shouldn’t try to do it all!!! Right on! A lot of people probably think I spend all day on social media. But I really don’t. I’ve got a system that works for me where I can promote what I want in just a few minutes each day. And then a couple of times a week, I’ll sit down and schedule some more material. Like I’m scheduling this one. You’ll see it pop up on Twitter, Facebook and Pinterest in the coming days! I’m all about making it easy. I love your tips. They are always so helpful. I do just enough to stay on ‘life support’ on the social media sites. The bulk of my business comes from referrals, networking (live and LinkedIn) and the numerous events that I attend. I actually had a lot of engagement on Twitter and Facebook a few years ago until outsourced it…engagement dropped off and I just haven’t had the interest/time to build it up again. You said that before Rachel and that’s great that you are getting most of yours from word of mouth and networking. I’m shocked you don’t get more online, but then again, if you aren’t putting the time in, that’s likely why. Nice to know I apply the 3 tips you gave & they do work for me. I do find that coming up with or creating the osts I want for our different platforms take time, not the scheduling part. I do 7 posts a day on FB & 10 on Twitter, active on Pinterest & IG post irregularly, blog 1x week. It is a lot & my partner does our graphics, photography, copy, maintains website. We try to have 100 products at all times. Our preference is expressing our creativity but we are doing social marketing & without our coach, it would be very confusing. Kristen. These tips were a great reminder to me. I am good about sharing my work of course, but need to add more information about the industry in general. Keeping people engaged is so important. I find sometimes that the posts I add in as ‘filler’ are often getting the most comments and likes. Yea, sadly the fillers usually get more than what we want them to engage in.. but keep pushing out great content around the filler Alene. Great tips! As one who sells in more than one niche, it is always a balancing act of how much to share about each. I have been working on a grid, and your tips will help! You got that right Robin, we have to continue to juggle. Yes, I am trying to all that you suggest. I have learned a lot along the way too. I have a love / hate for social media… but I could not handle only connecting via in person meetings anymore. So, I guess I love it more. Thanks for all the great info. I have that same love/hate Teresa and I am in the industry.. it is frustrating for sure. You are welcome! Loved these tips! Being on social media and making sure you are doing all the right things to help your business is so important 🙂 These 3 easy ways to use social media will definately help boost your business in no time! Thanks so much for sharing your value!! Thanks so much Joan, you are spot on! Kristen, I love your tips. I struggled for a long time with feeling like I HAD to be everywhere. I decided to pick a few platforms and do those really well. One thing I’m still navigating is finding my ideal clients in groups. Being in social media I struggle with that too Tandy, you aren’t alone. But I, like you… had determined I just don’t have time. I also struggle with my target too. Great stuff Kristen! I do try to provide great content and share it out across all social media platforms but find it difficult to get it all under control. There are so many different ways to schedule your posts and tweets but I don’t think I’ve found the right one yet. I love the idea of social media as I run across all kinds of interesting information. But, really need to get a handle on it and schedule better and write some posts ahead of time so I’m not so pressured to respond. Thanks for drawing my attention back to the basics. So glad that you see the value Joyce and if you need any help, please let me know. Simple, good tips. I’ve been trying to be more personable in my posts, especially with my posts last week from convention. I get caught between the gurus who say you should talk about what you do and the ones who say you shouldn’t. Head spinning! I started with trying to be everywhere, now I focus on PInterest and Facebook along with my FB Savvy Circle group. I found that creating a small group of women who want to be healthy has been the most beneficial for me. I am still doing it all in my early stages of my business, but hope to change that soon. That is great Karen.. having a group that you already know are interested does help. Yea Jackie, this is one of those things we all tend to forget, you are not alone! But hey I do for you, you do for me… usually works well.